It was an election triumph that very few could have predicted. In the end, political experience counted for very little. Americans demanded a president they could relate to and, even more importantly, one who was perceived as relating to them. Now they have their saviour. His brand of authenticity certainly stood him in good stead in the race against Hillary Clinton, who was never perceived as being genuinely authentic. Does anyone know the real Hillary Clinton? Over the years, she has surrounded herself with a self-protecting layer, and for many, this proved to be a real turn-off. She didn’t seem real. Unlike Trump, she has re-invented herself many times – and none of those times has really hit the mark. Her critics believe that her so-called authenticity comes from the expedient acts of a manipulative opportunist, no doubt engendered by her policy shifts over decades in the public eye. In her case, political experience counted for very little. So how do voters determine who is authentic and who isn’t? Research shows that when someone indulges in socially unacceptable behaviour, we attribute their behaviour to their real self and decide that they are being authentic. This is undoubtedly one reason why Trump is perceived as being more authentic than Clinton. It’s ironic to realise that “presidential” behaviour appears less authentic than making socially unacceptable statements. What a politician believes in his heart of hearts matters less than what his supporters think he believes in. The assertion that Trump “tells it like it is” means very little. The authenticity that people see in Trump does not include integrity, honesty, or even substance. In fact, truth seemed to matter very little over the course of the campaign. Many of his supporters said they didn’t really believe he would ban all Muslims or build a wall – and yet they also said “he tells it like it is” rather than “he says what people want to hear.” And still, Trump’s supporters perceive him as being honest. It was thought – and hoped – by many that Trump’s unremitting untruths would disqualify him from being hailed as authentic. However, authenticity is not quite the same as making true statements. Authenticity just calls for a person to say what he believes, not to say what is true. Former presidential candidate Ben Carson claimed that there are two Trumps, the one we saw on stage and the one who’s “very cerebral, sits there and considers things carefully.” If Carson is correct, the “authentic” Trump that appeals to the voters is just an act. The Trump on stage is just playing a role – not surprising with his many years of television experience. He brings into politics an impression of authenticity that comes straight from reality TV. Do we believe that Trump will be able to do this? Time will tell. As American historian and social critic, Christopher Lasch pointed out in the 70s, our usual concept of authenticity has a lot in common with narcissism. Does that mean voters who seek “authentic” candidates are really just seeking narcissists? If so, Trump has that in spades…. and so does Clinton. various leadership styles. Doing so doesn’t mean that authenticity is being faked. Authenticity means being self-aware, being adaptable, handling criticism and embracing the inevitable failures. Put simply, adaptation is the name of the game. Herminia Ibarra of INSEAD Business School explains that “Leadership identity can and should change each time you move on to bigger and better things.” It is to be hoped that this will be the case with Donald Trump. Trump has projected his own particular brand of authenticity and succeeded with it. He assessed what was driving the average working man and “told it as it is”. But what happens now? How will he leap the gap between what he has promised and what he is going to be able to do? He now has a new audience and he’s starring in a completely different show. While no one can fake authenticity long term……. one can fake it for a short period and in politics that seems to work fine, however in the real world it’s best and also possible to work at the practice of authentic leadership overtime and live it as a ‘way of being’. 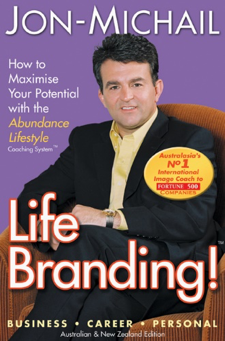 Jon Michail is Group CEO of Image Group International, an award-winning author and recognised as Australasia’s No 1 image coach. Image Group International supports executives, entrepreneurs, and their organisations to become iconic and monetised leadership brands. He is a regular commentator in international media organisations ABC, CNN, NBC, Harvard Business Review, Entrepreneur, Success, The Financial Review and Vogue.